The men’s volleyball team traveled to Siena Heights University for a four game tournament last weekend, which kicked off with two games on Friday. In the first game, the volleyball team squared off with Thomas More College. The first set was a closely contested matchup, filled with runs by each team. The Maple Leafs jumped out to a 10-4 lead. The Saints then responded with a run of their own to close the deficit back to just one, at 12-11. The Maple Leafs again would distance themselves, grabbing a 21-14 lead. The Saints battled back, but didn’t have enough in them to grab the first set. Maple Leafs 25, Saints 23. The Maple Leafs won the next two sets by a large margin. In set two, they took an 11 point lead at 20-9 and won the set 25-14. In the third set, the Maple Leafs’ lead was as large, at 24-10. 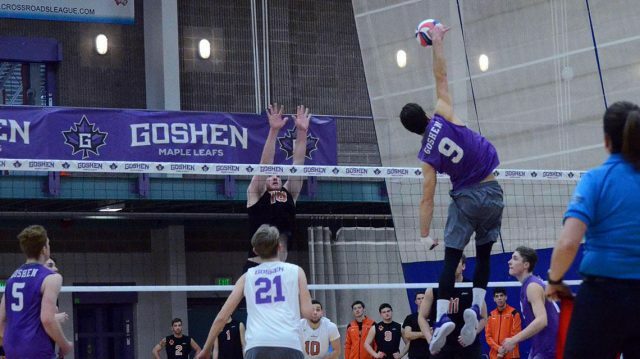 Goshen College won the set 25-12 and would complete the sweep. Alexander Rabadzhiev led the Maple Leafs with 20 kills. Sophomore outside hitter Brandon Watkins added 9. In their second game on Friday night, the Maple Leafs took on the Mustangs of Morningside College. The Maple Leafs fell behind early on as the Mustangs took the first two sets 25-16, 25-20. In set three, the Maple Leafs and the Mustangs went back and forth until the Maple Leafs pulled away 22-20. They went on to win the set 25-22. In set four, the Maple Leafs tried to push to the fifth set but fell short. The Mustangs jumped out to a 10-3 lead and didn’t look back. Mustangs took the set 25-19 and won the match 3-1. The next day, the Maple Leafs had two more matches. In game one, they faced off with WHAC conference foe, Siena Heights University. The Saints of Siena Heights showed their dominance from start to finish as they swept the Maple Leafs 25-16, 25-16, and 25-14. The Saints had no problems handling the relatively inexperienced and injury-plagued Maple Leaf team. Sophomore outside hitter Elias Baer and freshman middle Christian Rodriguez, two key contributors for the Leafs, sat out the tournament with long-term ailments. In their fourth and final game of the weekend, the Maple Leafs took on Cumberland University. The Maple Leafs won a closely contested first set, 25-23. The next set was another nail-biter for the Maple Leafs, this time winning 25-20. Finally, the Maple Leafs won their third and final set to complete the sweep, 25-18. With this win, the Leafs finished with an even 2-2 record at Siena Heights. Rabadzhiev earned all-tournament first team honors as an outside hitter, tallying 62 total kills. Sophomore Michael Wahl played a large role in this as he contributed 108 assists on the weekend. Watkins added six aces and Rabadzhiev and sophomore Nick Yutzy each recorded 30 digs. Wednesday, March 20 marked the next match for the Maple Leafs, against Lourdes University.